Chemical Composition: (Ca,Na)(Al,Si)4O from the plagioclase feldspar group. 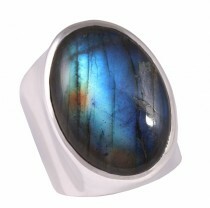 Quite simply, labradorite is named after the location where it was originally found and classified, Labrador in Canada. It goes by other names including Spectrolite (for specimens found in Finland) and Black Rainbow. Labradorite is an intermediate to calcic plagioclase feldspar, the meaning of which we will define below. Plagioclase refers to a whole series of feldspars that are in fact solid solutions. A solid solution is a mineral within which another or other elements have been dissolved and evenly mixed in when the minerals were in molten form at high temperatures (say, during volcanic activity). Upon cooling, the mineral crystallizes and hardens, and the dissolved elements remain interspersed within the crystal lattice of the mineral. With plagioclase feldspars, the elements dissolved within the mineral’s crystal structure are either Sodium (Na), Calcium (Ca), or a combination of both these elements in varying proportions. In Labradorite’s case, both Calcium and Sodium are present, with Calcium comprising between 50% and 70% of the dissolved elements, and the balance being made up of Sodium. As the molten mix cools, the Calcium, which solidifies at a higher temperature than Sodium, crystallizes first. This causes the elements to separate into layers within the feldspar lattice as they cool. These layers are known as lamellae and are responsible for the light play that makes labradorite so special. Depending on the conditions in which a piece of labradorite is observed, ones first impression of this mineral may be of a drab, brown to grey, semi transparent stone. However, at just the right angle, with only minimal exposure to light, this unassuming stone will reveal striking flashes of iridescent colour, as if it is emitting its own extraordinary light, in colours ranging from blue to green, yellow and orange, and on rare occasions, violet. The term, “Labradorescence”, has been coined specifically to describe this iridescence. Change the angle at which the stone is observed, and the colours and light may disappear altogether. This phenomenon is known as schiller. 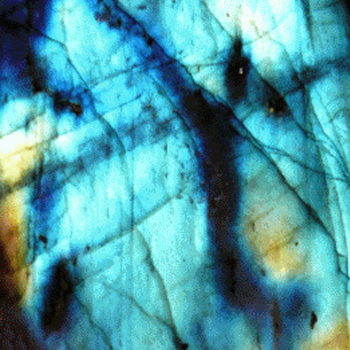 It occurs because of the passage of light through labradorite’s layers (or lamellae). As the light passes through, it will be scattered and refracted each time it hits a new layer. The number, thickness and angles of the layers will determine how the light is refracted and how much will be reflected back. In Finland, labradorite tends to reflect light in the full spectrum of colours, hence its being named, “spectrolite”. Eskimo legend tells us that a great warrior struck light-filled rocks he found along the coast of Labrador, Canada, with his spear and released what became the Northern Lights that fill the Arctic sky. Some of the lights remained trapped in the rocks. The Red Paint people of Maine were aware of labradorite as long as 1000 years ago. But it was not until 1770, that labradorite discovered in Canada was first noted by gemmologists. Discoveries in Russia and Norway around the same time caused labradorite to quickly gain popularity in Europe. 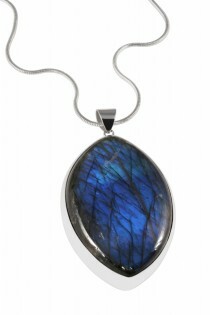 Labradorite is very popular as an ornamental stone with applications well beyond jewellery. It is worked by lapidary artisans and carvers into sculptures and even table tops and wall coverings. Labradorite is all about the Inner Light. The principle here is that when we allow ourselves to be open to Light, we reveal to ourselves our inner awareness, also expressed as light. Labradorite’s stunning light display is the result of its many crystal layers receiving and reflecting light back at different frequencies. Energetically, it works in the same way, awakening and illuminating the different levels of our awareness. It aids us in exposing deeply buried subconscious and unconscious belief patterns, thus giving us the opportunity to address these patterns. If they don’t serve our highest or truest purpose in life, our awareness of them means we have the opportunity to change or modify them. In this way, labradorite helps us to realign with our Truth. For those with emotional issues, this realignment may lead to greater self-confidence and reduced anxiety. For those who are consciously on the path of spiritual development, working through the levels may reveal ones Divine purpose. It is said that labradorite helps us to see beyond the mundane world, and to perceive and move between alternate realities and dimensions. It awakens ones intuition and sharpens existing talents such as clairvoyance, astral travel and prophecy. Practitioners of the inter-dimensional arts, such as tarot readers, psychics, magicians and the like will find labradorite a helpful ally.